Flinders Petrie collected dozens of hieratic ostraca, mainly from Thebes, though the place and dates of acquisition remain to be established. In the standard selection of such material drawn mainly from European collections (Cern�/Gardiner 1957), the Petrie ostraca represented the largest group after that of Alan Gardiner (the Gardiner collection is now preserved in the Ashmolean Museum, Oxford). The selection included most of the 91 ostraca, with facsimile copies of the originals, and hieroglyphic transcriptions for learners and for those who cannot read hieratic. There is no translation, but the introductory pages provide a guide to the contents of each item. 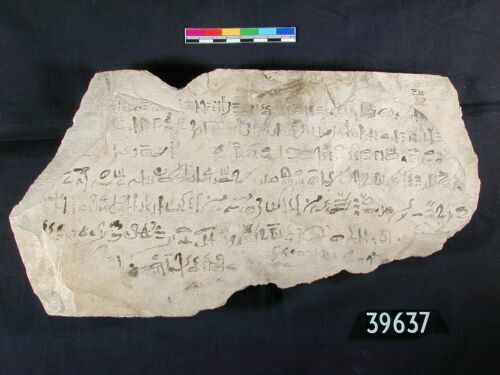 Below is hieratic ostracon Petrie 38, one of the largest in the collection, with a Ramesside copy of an excerpt from the Prophecy of Neferty (click on the picture for a larger image). The Petrie ostraca range over the full spectrum of topics covered by these writings, and are mainly on small pieces of limestone - effective as a background for writing in black and red, and, in the tomb-cutting projects along the Theban mountain edge, abundant. A small proportion of the ostraca are on fragments of pottery, giving a less clear contrast for writing in red, but still an effective background colour for writing in black. There are few examples where the place of acquisition is recorded, but the contents confirm that the great majority of these ostraca are from Thebes - either Deir el-Medina itself, or places where the Deir el-Medina crews worked (principally the royal tombs in the Valley of the Kings). For initial reference, the spectrum of content may be divided into the categories suggested below, though these are problematic with such small passages of writing - an apparently literary composition may be part of an incantation to be recited to restore good health to a person, as in the start of the Tale of Isis and Ra, for which the healing purpose is demonstrated by the long version preserved on a papyrus probably from Deir el-Medina now in Turin. The numbers of Petrie Museum ostraca in each category are given for reference only, as the sample is too small to offer a reliable guide to the likely proportion of output in original production. Petrie also assembled a collection of 'figured ostraca', or sketches by artists, draughtsmen, scribes, also on pieces of pottery or limestone. Although usually separated for modern analysis, most 'figured ostraca' come from the same world of production as most hieratic ostraca, and should be considered together. They are not included in the list below, but listed in full on the linked page, to avoid confusion in reference, as Petrie gave to both sets sequence numbers starting at 1. The following list of Petrie hieratic ostraca is in the sequence as numbered within the Petrie collection, by which the material is most often cited: also given are the current museum number with UC prefix, the plate reference in Cern�/Gardiner 1957, and the contents. 79 UC 39665 (not published in G-C) documentary memo?